The new Force India had a soft-launch over the weekend, with pictures first appearing a day ahead of Sunday’s official release. Today these studios shots were joined by a whole host of Q&As from the FIF1 press office which you can find on the usual news sites, as well as pics from Jerez. The big news is the switch from a Ferrari customer deal to an agreement with McLaren-Mercedes for the full powertrain – that is the engine, gearbox and KERS systems, as well as technical co-operation in other areas. 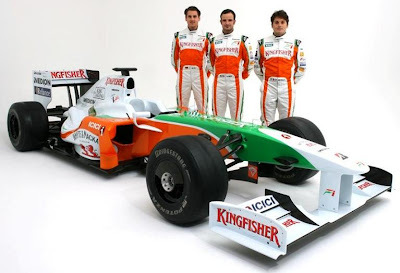 Simon Roberts of McLaren is now the Chief Operating Officer at Force India as part of a personnel shake-up. Mike Gascoyne and others have left the company. The basic theme running through all of the Q&As is that the new McLaren/Mercedes deal frees up FIF1 engineers to work on other aspects of the car, such as aero and internal packaging. It means that as other teams cut back, Force India don’t need to worry about that and can concentrate on the task at hand: working their way from the back of the field to regular points-scoring positions. 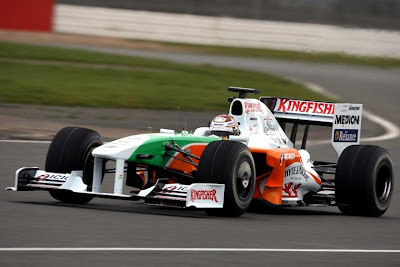 The first chassis was shaken down at Silverstone last week and Fisichella took it for a test at Jerez today. Liuzzi will shake down the second car during this week before the final big pre-season group test in Barcelona. It’s a good looking car, quite aggressive with another high nose. The late launch means the car has spent longer in CFD and in the wind tunnel than their competitors, many of whom will need to do an (expensive) upgrade for the first race of the season. I hope they are able to close up the remainder of the gap to make the midfield a close fight. They made some big gains in lap time last year even if that wasn’t represented in positions, in qualifying they used to be 3sec off the back and last year they were about 1 – 1.5 sec back. A long time in F1! The downside here could be the decision not to run KERS until very much later than everyone else. Some reports suggest they won’t run it until May – that could prove to be a mistake. Still, at least they’ll be ahead of whatever Honda becomes.. Tomorrow Williams will launch their Formula 2 car powered by Audi, I’m not sure if I’ll be around but I’ll put a short post up about that some time this week as well as something on the Le Mans entry list. A decent looking car, I think, but the weird bulgy bit on the trailing edge of the sidepod sort of ruins it for me. It looks like a beer belly hanging over a belt. Too much Kingfisher, maybe?